With cushions from our 1960’s red tapestry couch lined up along the carpet of the living room floor, I attempted to perfect a simple cartwheel. Arms high, legs apart, feet pointed and concentration focused, I twirled. And twirled. And twirled. Over and over again. Trying to perfect a simple cartwheel. Hundreds and hundreds of times, I tried. But I could never get my legs straight. I could never twirl in the air like a windmill. Each time I attempted to perfect a cartwheel, I landed sideways, off of the cushions, onto the floor. Every single time. 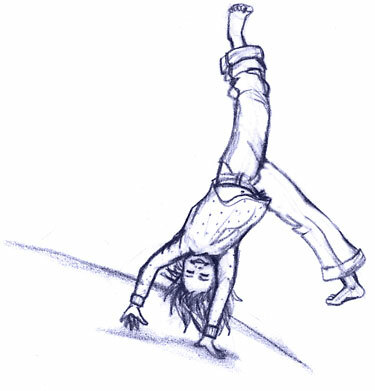 Completing a simple somersault was even difficult for me at times. I never yearned to be an Olympic gymnast as a child. I never held dreams of winning gold medals and standing on a podium, representing my country while singing along to the National Anthem. Being on the cover of a Wheaties box or a ‘Sports Illustrated’ magazine held no relevance to me. All I wanted was to be able to flip through the yard on my hands and feet, feeling the cool grass between my fingers and toes as I brilliantly and cleverly defied gravity… just like other girls my age were doing. Friends made it appear so effortless and easy, I couldn’t grasp why my own body didn’t cooperate. Was I physically challenged? Had I been dropped as a child? What was my handicap? It was frustrating and disheartening. As time passed, I slowly came to the realization that I simply did not possess any gymnastic coordination or aptitude (never for lack of trying, mind you, but for lack of capability.) Maturing from child to woman at a very young age, my hips, chest and mid-section grew at an alarmingly rapid rate. Physical coordination was nearly impossible for me during that time. In particular, I recall hiking frequently with my family during numerous childhood camping trips, and my hips and ankles would ache on an almost constant basis. I would tire easily and become light headed during most activities and would pray for a quick finish. Experiencing ‘growing pains’ was not merely a metaphor, but rather a vivid reality. Learning to dance The Hustle was perhaps my biggest achievement in P.E. class. I was incapable of bending into a backflip, I couldn’t climb a rope (most girls can’t, but it frustrated me anyway) I couldn’t run track, and I couldn’t balance for more than two seconds on a balancing beam. Free-throwing a basketball into a hoop was doable, and I was proud of my achievements in that category, but dribbling that same ball down the court was quite another story. Now, this is not to say that I was inept at ALL physical activities. In fact, I quite excelled at roller skating, had been swimming since toddler-hood and could ride a bike all over the neighborhood and back again. But my overall physical aptitude was well below-par, in my perception. So, the rounder my body became, the less I tried to tackle gymnastics and sports and simply concentrated on other, more attainable goals: writing, painting, drawing, immersing myself in academics. I stayed active with roller skating and bike riding and running around with friends, but I pushed the need to perfect a simple cartwheel out of my mind. Eventually, I accepted the shortcoming and moved on. To everyone, there are limitations; we all face them at one time or another, much to our chagrin. However, an honest attempt should still be made to overcome those limitations – because challenging ourselves is a crucial component to discovering our abilities. How else are we to know what we are truly capable of? Experience everything, at least once, but ultimately, don’t beat yourself up over an inability… because chances are high that you’ll succeed in many other areas, and those successes will reduce those shortcomings to mere dots on the grand scale of life. Perfection is overrated. 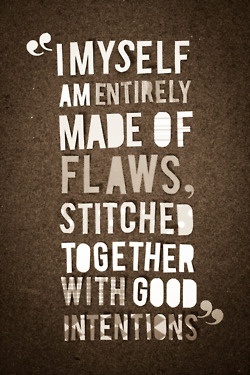 Why not try being perfectly flawed instead?